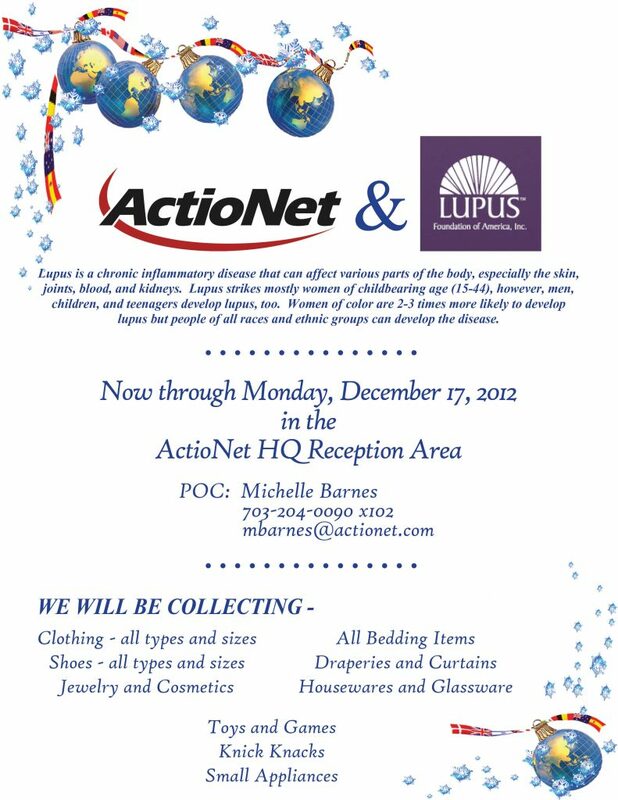 Home / Who We Are / Community / ActioNet Sponsors The Lupus Foundation of America, Inc.
ActioNet Sponsors The Lupus Foundation of America, Inc.
ActioNet hosted a household goods donation drive to benefit the Lupus Foundation of America. Lupus is a chronic, autoimmune disease that can damage any part of the body (skin, joints, and/or organs inside the body). In lupus, something goes wrong with your immune system, which is the part of the body that fights off viruses, bacteria, and germs (“foreign invaders,” like the flu). Research estimates that at least 1.5 million Americans have lupus. Lupus strikes mostly women of childbearing age (15-44). However, men, children, and teenagers develop lupus, too. Items donated will be sold to for-profit wholesale buyers. These donations help support vital programs for individuals with lupus and their families, in the communities. ActioNet collected: Clothing, all types and sizes; shoes, toys and games. The Lupus Foundation of America is a charitable organization with tax-exempt status granted under Section 501(c)(3) of the Internal Revenue Code. Our Federal ID# is 43-1131436. Donations are tax-deductible to the full extent allowed by law. ActioNet continues to support the community with varies outreach programs.